I was recently asked whether or not I believed that I could maintain my muscularity and fitness solely by performing bodyweight exercises. Without hesitation I answered, “Yes.” As you progress to more difficult variations and increase the number of repetitions you perform with the various exercises, you will continuously challenge your neuromuscular system. Your body will respond by synthesizing more protein and laying down more muscle tissue. In essence, your body adapts by building a bigger engine. Recent studies have shown that high repetitions can provide a potent muscle-building stimulus, more so than most experts imagined. I’m glad you’ve decided to take the bodyweight challenge and learn how to manipulate your body to achieve a world-class workout. I’m glad that you’ve decided to no longer be a slave to the gym. Now the world is your gym and you are the resistance. This excerpt is from the book, Bodyweight Strength Training Anatomy . It’s published with permission of Human Kinetics. 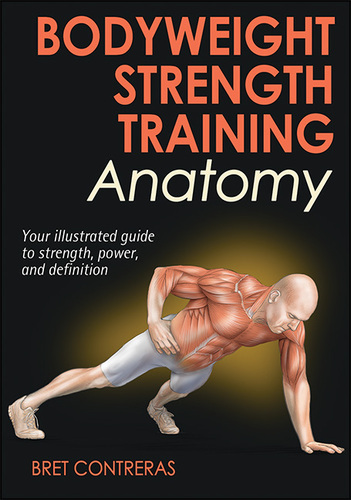 Purchase this book from Human Kinetics and help keep MyTriathlonTraining.com in online!